Nick Turse has a fine op-ed in the New York Times, “For America, Life Was Cheap in Vietnam.” In it he argues that for Americans involved in the Vietnam War, life was very cheap indeed – Vietnamese lives, that is. Turse has written a powerful book, “Kill Anything that Moves,” that documents the total war the United States waged on the Vietnamese people and countryside. As Turse notes in his op-ed, American leaders like General William Westmoreland demonstrated “a profligate disregard for human life,” mainly because their strategy “was to kill as many ‘enemies’ as possible, with success measured by body count. Often, those bodies were not enemy soldiers,” Turse concludes. I recently came across two accounts that lend further support to Turse’s conclusion. The first is an article written by Bernard Fall, “This Isn’t Munich, It’s Spain,” published in Ramparts in December 1965. (My thanks to Dan White for bringing this article to my attention.) Bernard Fall was an expert on Vietnam; among other classic books, he wrote “Hell In A Very Small Place” (about the siege of Dien Bien Phu) and “Street Without Joy.” He was killed by a mine in Vietnam in 1967. “A truly staggering amount of civilians are getting killed or maimed in this war,” Fall concluded, illustrating his point by recounting an air raid he had accompanied that destroyed a Vietnamese fishing village. But even more worryingly for Fall was that “The incredible thing about Vietnam is that the worst is yet to come,” a tragically prescient statement. 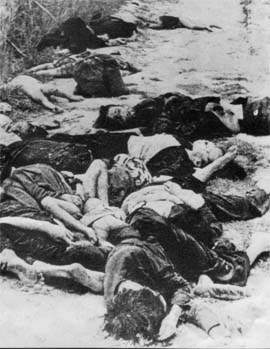 In a war in which commanding generals rewarded American troops for generating high enemy body count and punished those “slackers” who didn’t kill enough of the enemy, small wonder that Vietnam became an American killing field and a breeding ground for atrocity. In Vietnam, the U.S. used immoderate means, often with wanton disregard for the lives or livelihood of the Vietnamese people, in pursuit of ill-defined ends. Echoing Fall’s words, we pursued open-ended devastation for no clear purpose with little regard to moral responsibility. We lost more than a war in Vietnam. We lost our humanity.